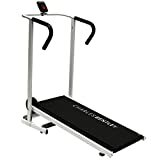 This Charles Bentley non motorised treadmill is a great stand alone piece of equipment that will help you to keep fit and healthy. This treadmill is self powered allowing the user to be in control over speed and intensity. The treadmill can be folded to save space and is easily moved due to a purposely designed transport wheel. This item has a slight incline and additionally has an electric monitor which can track the workout. Please note: Maximum user weight is 100kg.